Create Personalized T-Shirts that expresses your creativity and humorous side with a Personalized Any Message Here T-shirt. This unique Personalized Gift is perfect for any special occasion. Dad will love his Personalized Shirt for Father's Day or perhaps give a humorous Custom Printed Message Shirt to your best friend at his birthday party. Your Personalized Any Message Here T-Shirt is available on our premium white 100% cotton Personalized T-Shirt, machine washable in adult sizes S-3XL. Includes FREE Personalization! 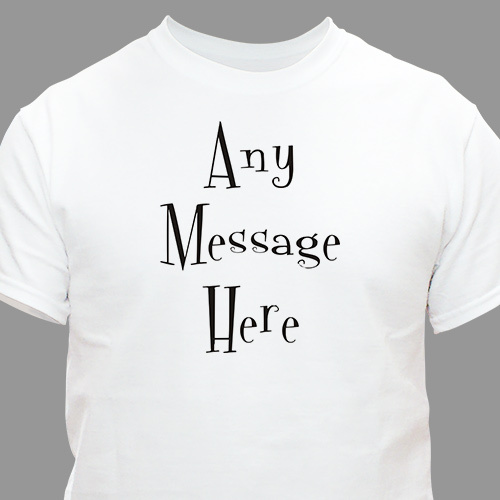 Personalize your Any Message Here T-Shirt with any three line message in our Mystical font, choose between 10 different colors for the text. I got the shirt for my husband "He loves it"